You can find FF Meta all around you, this is a collection of designs where we found the use of typeface FF Meta. FF Meta® is a wonderful typeface designed by Erik Spiekermann, the font family was released between 1991 and 1998. A very readable typeface in smaller point sizes but also with enough detail to display in large point sizes. 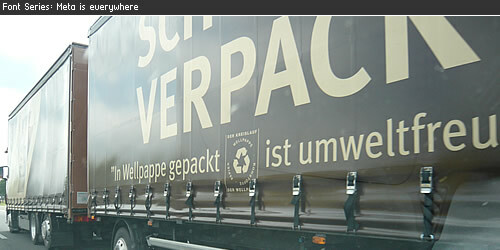 FF Meta is a sans-serif typeface which can be found all around you. The last several months where every I came (The Netherlands) I saw typeface Meta, in this font series you can see the many different faces of the FF Meta®. 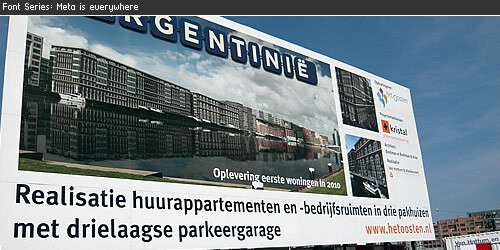 A large size billboard with information about houses in Amsterdam, you can clearly see the power of Meta with the readability from a great distance to this billboard. 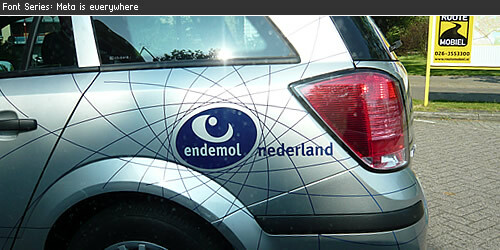 Waiting for a free pomp I spotted the logo of Endemol at the side of a car, it seems to be the Meta Bold, but I’m not sure about the letter – l – , anyone? 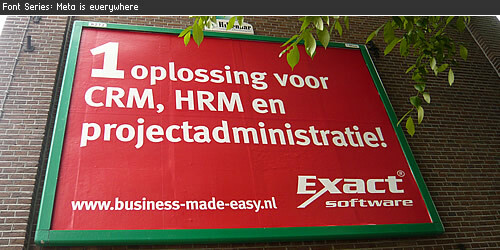 A big advertising for a Dutch company that sells small business software, used the Meta Bold for their billboard campaign. Also easy readable from a distance. In Holland you see the bike bags very often. 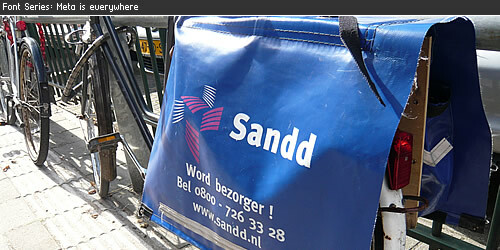 Displayed is the logo of Sandd a new post company which uses the Meta for their visual communication. Quickly trying to get my camera and take a shot while driving, I was mislead by the big company name. But the payoff is display in Meta Book. Even on my holiday I spotted the Meta, this time the Caps version got my attention. 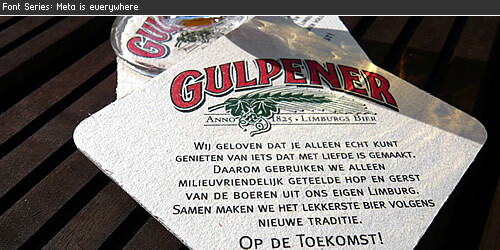 A Dutch Beer Browery Gulpener used the Meta Caps on various visual level of communications. A small supermarket company is using Meta Book & Bold to show their latest offers, I’ve also seen plastic bags printed with logo and text using the typeface Meta. 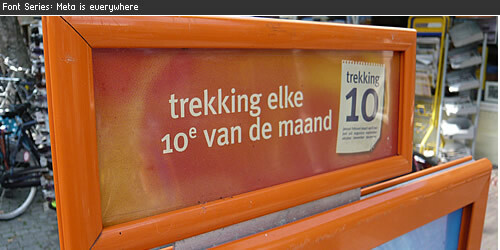 Hollands biggest (run by the state) monthly lottery uses the typeface Meta! Not for all forms of visual communications but here I spotted a announcement created in Meta Book. 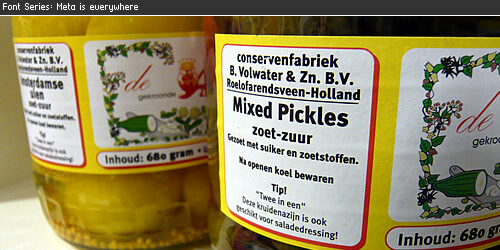 A Dutch company Volwater uses various weights of FF Meta to display the information on the bottles, a good example of various font weights working together. 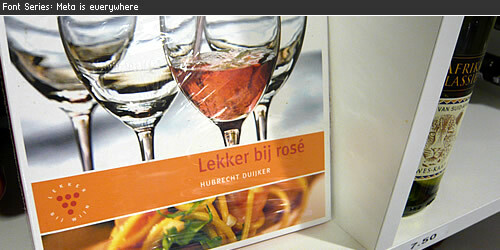 Huibrecht Duijker is one of Hollands famous wine lovers, he writes, tells and drinks wine. In this small booklet the typeface Meta is used in various ways, bold, caps, book. It shows again that Meta is a very eligable typeface for small point sizes. 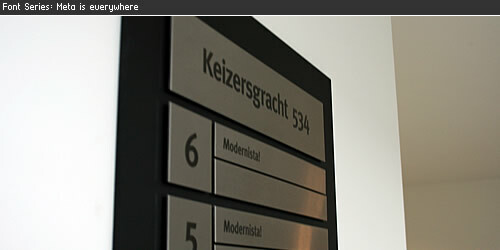 This is an example of signage made with Meta Bold, created in our company I suggested to the owner of the building to go for Meta in all signage and wayfinding. 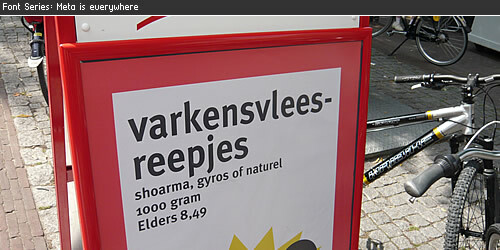 Found through photo website flickr, a shopping window printed with various font weights of Meta in a nice design. 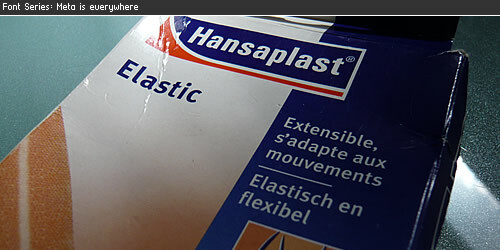 Went through our medicines and found the package of Hansaplast who are using the Meta in English and Dutch text at the front and backside of the package. 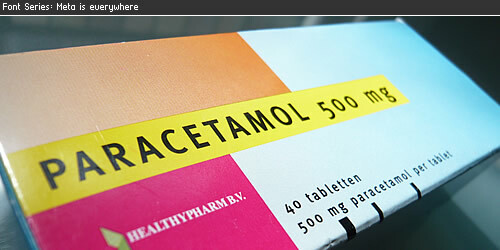 With this package of paracetamol you will never have a headache again. For all text on the package they are using the Meta in Bold and Book typefaces. 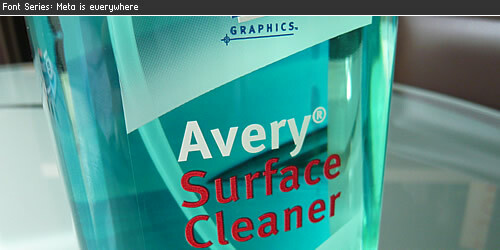 To clean and remove adhesive vinyl foil you can use the Avery Surface Cleaner, a clear usage of font type Meta Bold on the bottle. 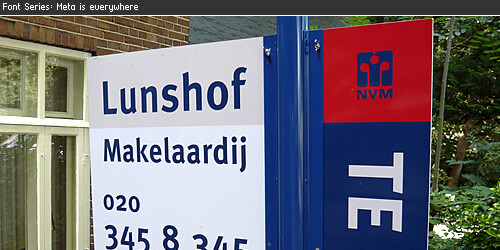 A Real Estate Sign from Lunshof is using Meta as their house type. A good readability with the use of blue fonttext and white background. 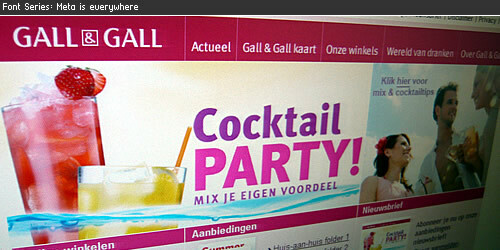 Hollands largest liqueur store is using Meta for all levels of visual comunications. 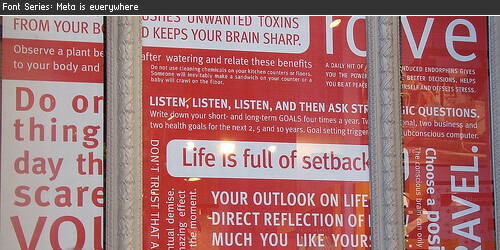 The stores, posters and internet website is filled with the Font Family Meta. A Meta tread to buy your favorite wine or beer at Gall & Gall. The Complete Font Family contains a package of 24 variations (via FontShop) and was published by FontFont (see their website for lots of Meta usage), is available in the following formats Mac PostScript, PC PostScript, PC TrueType. All styles Book, Caps, Bold and Bold Caps are also available in Italic. Starting from a set of 3 fonts at € 40,- to the complete font family for € 229,-. When bought at FontShop you can download the fonts after the purchase and start using them right away. Although FF Meta® is not in the top 10 bestsellers at FontShop I believe this is a very popular font. The complete overview of 55 variants of Meta Font Family.